As a runner and a cyclist, events like these appeal to my inner teamplayer, and I’ve recently jumped on the bandwagon. This past spring, I had the chance to race on National Geographic ADVENTURE’s team in the Drambuie Pursuit, across the Scottish Highlands. 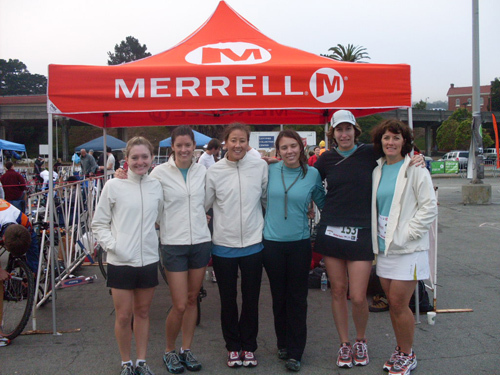 And over last week, I joined the ranks again, this time at Merrell’s Oyster Urban Adventure Race, in San Francisco. The Oyster is a combination endurance event/scavenger hunt that plays out in stages. (Picture The Amazing Race pared down to a one-day event.) The specifics are kept secret beforehand and revealed in clues as the race progresses. All we were told ahead of time is that we’d be combing the hills of San Francisco, on foot, bike, rollerblades, and public transport—and possibly getting wet. Fifty-five teams competed. Some had three members each, others were “six-packs,” like my group. I raced with Runners World’s Sarah Bowen Shea and Lisa Jhung, Alpinist’s Christina Erb, Fitness Magazine’s Rachel Sturtz, and freelance writer Dana Sullivan. Teams of six handed off between three competitors at a time, so I didn’t race until the second stage: an eight-mile run from Crissy Field, through the Presidio, and then across the Golden Gate Bridge and back. (And, yes, San Fran’s hills are just as brutal as everyone says they are. Seriously.) But we made good time on the run, and I felt fresh enough at the end to jump right into stage three: a rollerblading sprint that took us first to Giants Stadium—to snap a photo with a Giants and a Dodgers fan shaking hands before the rivaled game—and then across town, through the Folsom Street Fair, before racing back to the start. I sat out the next stage, a round of stand-up paddleboarding in the bay, before jumping into the saddle for the final leg. I’ve never biked in a major city before (I grew up in rural Ohio, people), so racing along congested Van Ness Avenue is one of the scarier things I’ve put myself through. But it was worth it: We notched a close second-place finish in the six-pack division and placed tenth overall—especially exciting considering we were the only all-female team in the bunch. There are still chances to crack your own Oyster this year: Austin, Texas, will host a leg of the series on October 12, followed by Portland, Oregon, on October 18. Register online at oysterracingseries.com. Don't worry there are still event like this that you can join but you need to be physically fit since this is not your typical racing event. I came across this blog and I liked it. I know it's been almost three since then but this is truly a nice post. I've been wanting to join events like this. Let the record show, folks: Andrea (and teammate Rachel) were the smiling workhorses of our team. Andrea did the three hardest legs of this fantastic race. And she was a champ the entire way.